Antique bottles are more popular than ever! Not since the 1970′s has the popularity of antique bottle collecting grown at such a rapid rate. The resurgence of collecting is due to many factors, but one major contributing factor is the rising popularity of Internet, and online auctions. Ebay.com, the world’s largest online marketplace, has helped tremendously in creating a new marketplace for collecting and inspiring a new generation of collectors. More likely, however, it is the fact that bottles stand on their own as beautiful handmade objects and on older pieces made before 1900, no two are alike. For some, bottles remind them of the old west; saloons, brothels and traveling medicine shows, the days of Buffalo Bill and Mark Twain and the bottles that came with them. Other people collect fine glass, made by the most expert glass production houses in the United States at the time. Factories like Sandwich and Stiegel and the other glass houses in New England and New Jersey. Still, others simply collect whatever catches their fancy, their collections, a hodgepodge of newer and older, blues and ambers, mostly dictated by whim and simple interest, and a desire to just collect. Regardless of the type of collector there are some basics which govern what people collect. how many specimens are there out there? It is not unusual for a bottle to be one of only 2 or 3 known. This is good sometimes and sometimes it makes a bottle cost prohibitive to purchase. is the glass uneven and does it show the individual characteristics of a handmade bottle? One bottle may sell for $50 while another may sell for three times that. Crudity is an important factor when determine the value of a bottle. one specimen might be worth $100 while another bottle of the exact same mold might be worth $3000. Why? Color, color, color. In some specimens, there may be hundreds known in amber, with maybe half a dozen in green. The rarer color always attracts the heavies, they’ve had lots of opportunities to buy an amber example and rarely get a chance to purchase the rare colored one. bottles from San Francisco are the most popular for collectors of Western bottles for instance. This adds value, especially if it has the name embossed on the bottle. For people who live in New England, the opposite is true. There are other things that make a bottle appealing. It might have an unusual shape, or have a misspelling on the bottle. Some bottles are worth more because of the particular marks of a specific mold maker. Bottles are basically broken down into two collecting areas. Bottles made in the West Coast and bottles made everywhere else. Bottles made in the West (or in some cases doing business out here but made outside of the West) are usually more valuable for a simple reason; in the 1870′s there were a lot more people outside of the West and less bottles were made. They are rarer and the bottle houses that produced them put out a very distinctive and desirable type of glass. a medicine loaded with alcohol and herbs, usually a diuretic that simply made you feel better. They come in every shape and color and were made for a long time. There are some excellent references featuring this type of bottle. It is one of the more interesting areas of collecting. an obvious choice, whiskey was a very popular beverage in the early days, anything to soothe the weary body and mind. This includes everything from western whiskey fifths to Binninger bottles made in New York. Usually collectors go for one particular geographical area. this would include all other alcoholic drinks other than whiskey including rum, gin, schnapps and almost anything you can think of that is sold today (except tequila, maybe). This also includes bottles made overseas. Lots of gin was consumed in the early days of this country, and a lot of it came from Europe. Rum was also very popular early on in this country, it is said George Washington consumed as much as two liters a day! these include everything from Owl Drug Store bottles made in the 1900′s to early colored pontiled medicine bottles that can sell for thousands of dollars today. This is another very interesting and wide area of collecting. Most collectors concentrate on a geographical area or particular era. this may be the most interesting area of collecting and one that almost anyone can enjoy. Today people who see a true history in the glass made during that period collect flasks made from as early as 1820 to as late as1880. Some flasks have pictures of famous people or events that happened during the growth of the United States. These are called commemorative flasks. Other flasks have simple designs or sayings and almost all of them come in every color from aqua to blue to deep amber. Another advantage of collecting historical flasks is that they are affordable for everyone. You can still buy a nice cornucopia flask for under $70. Not bad for a bottle that was made as early as 1850.
here’s another fascinating area of collecting, inkwells come in some many sizes, colors and shapes, the possibilities are endless. One of the more popular shapes are the umbrella inkwells that are actually shaped like an umbrella. They come in loads of variants and colors and can be an area of collecting in itself. There are other inks to collect including master inks or the bottles that held the ink that filled the inkwells. American Bottle Auctions recently sold a rare western variant for thousands of dollars. another very interesting area of collecting, these include thousands of different companies, shapes and sizes. We all know about how in the early days people had to can their own food. Well, they needed something to put it in and these early jars re the focal point of many a collection. In addition, there are a number of pickles or sauce bottles people collect and these can be very colorful and fancy. There are a couple wonderful books on the subject available in the Resource page of this website. these contain a number of different bottles and jars made for everything from shoe polish to glue. A number of these are early pieces made in the 19th century and some are very crude and beautiful. This area might also include cologne bottles. Another area of collecting that has no limits. a sophisticated area of collecting, this includes compotes (fancy dishes to serve various delicacies) pitchers, creamers, candlesticks, vases, stemware, bowls, salt containers and other pieces of glass used for display and function. Collectors of this type glass need to spend a lot of time understanding the different glass houses, types of glass, areas of production and different objects made. Since these pieces were made for such a long period of time (generally 1820 to 1890) there is a lot to take in and the learning process really never stops. Certainly one of the most interesting areas of collecting, it does include some bottles but also encompasses a wide area of collecting. and pretty much anything else you can think of that people used during the growth of our country. For everything there is a collector and for every collector there is something to collect. Regardless of the area you collect, it is often the thrill of the chase that creates the most fulfilling part of putting a collection together. I know people that may collect inks and once they feel they’ve accomplished this task, they sell their collection and start on something else. Some people collect a little of everything and some people collect only one tiny area of a very general topic. Income dictates what you collect but therein lies a misconception, too. Sure a historical flask collector would like to own a rare Baltimore flask in sapphire blue, but starting out with a crude, sparkling example in aqua can be just as rewarding. Some people say that whatever you collect, just make sure that you like it. That’s the most important thing. If it goes up in value, great, you’ve not only collected something you like, but it has been a favorable investment, also. It’s hard to imagine where bottle and glass collecting will fit in, in say, a hundred years from now. You can bet, however, that there will always be people who appreciate the fine craftsmanship and raw beauty contained in glass. You don’t have to go far to see it. Remember, sometimes the best bottles are empty! I think we refer to bottles. We were the first to put our auctions online. Now it seems like a no-brainer. Great ste. Tell us what is whittle? Whittle is the unevenness on the surface of a bottle that resembles the appearance of a whittled piece of wood. It was thought for some time very early on that it was caused by the mold being whittled or made of wood. That theory was rebuked as wood would have burned to a crisp having molten glass being blown into it. Instead, the molds were iron and the whittle effect is caused by a cold mold so that when the glass hit the cold metal it caused the unevenness that we refer to as whittle today. It is a desirable trait in bottles, the more whittle the better! I have antique bottles and medicine bottles for sale in Green Bay, Wisconsin. Low price. Pick one or take all. I have a clear coke bottle that has a false bottom in it. (guessing it to be 30 years old due to time I found it.) It has actually another glass bottom that rolls around inside and I have never seen or read anything that is anywhere similar to this. I realize it is a one of a kind manufacturing flaw. Is there any info on this or a way to determine value? The bottle otherwise is in good shape. 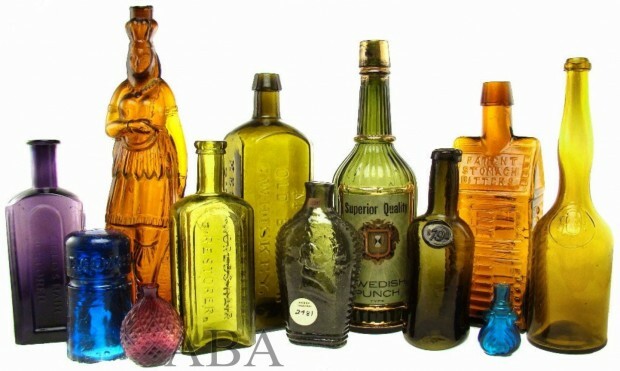 This was a best collection of adeque bottles because it is the fact that bottles stand on their own as beautiful handmade objects and on older pieces made before 1900, no two are alike. For some, bottles remind them of the old west; saloons, brothels and traveling medicine shows, the days of Buffalo Bill and Mark Twain and the bottles that came with them. Other people collect fine glass, made by the most expert glass production houses in the United States at the time. Factories like Sandwich and Stiegel and the other glass houses in New England and New Jersey. Still, others simply collect whatever catches their fancy, their collections, a hodgepodge of newer and older, blues and ambers, mostly dictated by whim and simple interest, and a desire to just collect. Antique Bottles of Vancouver Island, B.C. Canada AND U.S.A.